There are many leaves on the ground. Go ahead and take a guess right now. I mean it. Don't keep reading until you've chosen the subjects. Are you ready? Great! If you guessed there, I'm sorry to say that you're wrong. You may have been tricked by the order of the words in the sentence. Many of our sentences follow the sentence pattern of Subject + Verb. That is partly what might have made you think that there is the subject: it comes before the verb. However, in sentences that begin with There is and There are, the subject actually comes after the verb! Place is the subject in the first sentence. Leaves is the subject in the second sentence. Now we know what the subjects are, but what is the word there? There often acts as an adverb answering the adverb question Where? as it does in the following sentence. I parked my bike there. Where did you park your bike? I parked it there. But in the sentences that we're looking at, there doesn't tell us where. There is simply an extra word that is not grammatically related to the rest of the sentence. Notice that we don't lose any meaning when we rewrite our sentences without there. There is no place like home. 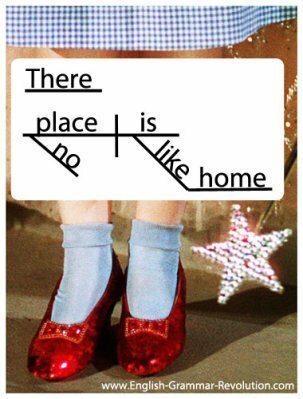 ---> No place is like home. 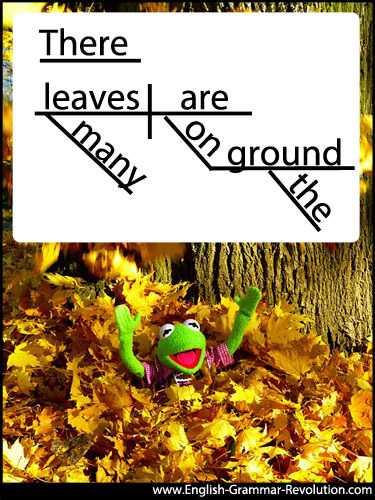 There are many leaves on the ground.--> Many leaves are on the ground. There is trying to trick you into thinking that it is the subject, but it's not. It's an expletive. In the world of grammar, expletives aren't swear words. They are words that serve a function but don't have any meaning. The word it can also be an expletive. It is Les Miserables that makes me cry. By the way, there and it are expletives in these sentences, but they are also called dummy subjects. Since the word there is not grammatically connected to the rest of the sentence, we diagram it on a line floating above the subject in the same way that we diagram interjections and nouns of direct address. If you've been diagramming for a little while, you might feel strange having the verbs is and are sitting there without anything after them. If you're wondering what's going on, you might be under the misconception that is is always a linking verb. The truth is that it's is isn't always a linking verb! In the book The Wonderful Wizard of Oz, Dorothy's slippers are silver. At the time the movie came out, the movie industry had just begun using its new technicolor process. (Before the movie, everything was in black and white.) 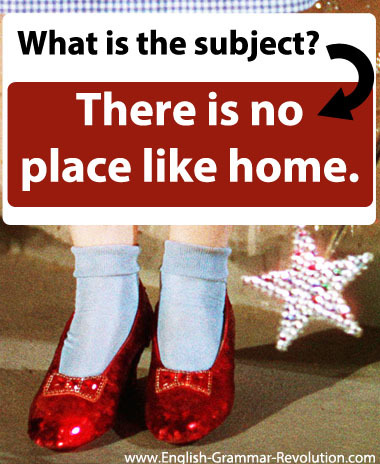 In order to show off the amazing color in the film, they made Dorothy's slippers red (ruby) instead of silver! You probably already know that people frown upon using too many sentences that are written in the passive voice. Well, people also frown upon overusing expletives at the beginning of sentences. When you start your sentences with expletives, they can become vague and wordy. Try rewriting the following sentences so that they don't begin with there. There is a fly in my soup! There are sixteen candles on my birthday cake. There were five dogs howling at the moon. There is a broken pencil in the pencil sharpener. A fly is in my soup! Sixteen candles are on my birthday cake. Five dogs were howling at the moon. A broken pencil is in the pencil sharpener. Woodward English shows you rules for expletives and subject verb agreement.